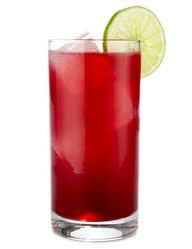 We asked the bartender at a hotel in Warsaw for vodka and cranberry juice, but he claimed never to have heard of such a thing. When we described it to him, he offered to substitute blackberry brandy for the cranberry juice, and that turned out to be satisfactory – enough so, that we ordered it every day we were there. I think about cocktails at this time of year, because I have associated them with New Year’s Eve since I was a child. It seems to me that images associated with the occasion — in newspaper ads, for instance — invariably have martini glasses along with the confetti and streamers. Before I started going out to New Year’s Eve parties and confronted reality, I thought of them as the epitome of sophistication, and cocktails were intrinsic to the concept. I guess I don’t think of myself as being sophisticated, because the only mixed drinks I like are vodka and cranberry and gin and tonic, and I haven’t had a gin and tonic in about a decade. Coincidentally, I read today that Franklin Roosevelt loved to mix drinks for his friends and visitors. According to the author of the book that will be the subject of a post sometime next week, FDR especially liked to flourish the shaker. His own favorite cocktail was the Horse’s Neck, which in his case meant whiskey and ginger ale. The drink gets its name from the twisted lemon rind submerged in the glass. When I was a kid, I liked the names of individual drinks my parents and their friends mentioned — Black Russian, Manhattan, Brandy Alexander, Tom and Jerry, Tom Collins. Those names were right out of Esquire, and I’d rather not say how I knew that when I was a kid. One of those names was Presbyterian, and I understood years later when my father-in-law, strictly a social drinker, got hot under the collar at a wedding we attended, because the young bartender didn’t know what a Presbyterian was — namely bourbon, club soda, and ginger ale. That young guy aside, I always thought of the bartender as the archetype of cool. I still occasionally think that I’d like to be a bartender if it was in just the right kind of establishment — high brow, cool, “the ladies who lunch” kind of place. That may be why I wandered into a hotel bar in Manhattan one early afternoon many years ago while I waited for the actress Jane Russell to keep an appointment with me. Dim lights, highly polished dark wood, barkeeps with black vests, and garters on their sleeves. 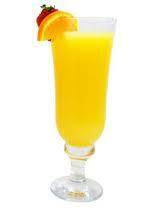 At the time, I had taken a few turns with Harvey Wallbanger while pretending to keep up with some of my harder-drinking friends, so I sat alone at the bar and ordered one. I think I imagined myself in a movie, circa 1948. The bartender allowed as how Mr. W. hadn’t caught on yet in Gotham and, when I had fought my way to the bottom, he asked if the drink had been satisfactory. I had no idea, but the script made me say that it was a bit too heavy on the Galliano. I think I wished at that moment that I was a smoker, because exhaling a long stream before answering would have added so much to that scene. My host was accommodating nevertheless, and he served up another on the grounds that the customer must be satisfied. My appointment was long in coming, and Roberto got the proportions right on the third try. When Jane Russell came down from her room in a cloud of apologies, I wouldn’t have made her feel guilty for the world, and I gallantly agreed when she asked if we could find a place with strong black coffee. 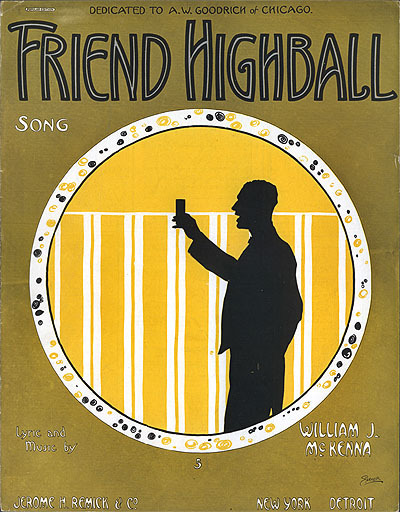 Sheet music cover for "Friend Highball" lyrics and music by William J. McKenna, 1915.